This MezIO module adds four USB 3.0 ports to the CRNS124 industrial computer. 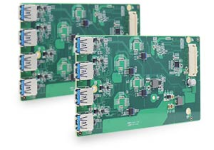 The card has two independent Renesas controllers for improved bandwidth. Requires a CRNS994 panel (sold separately) for a complete installation.